Some storms are moving across the area as some upper level energy has provided fuel for that warm and humid air mass at the surface to convect. The atmosphere here in Connecticut is generally characteristic of a 1500-2000 j/kg MUCAPE airmass. Damaging winds and even some hail cannot be ruled out although that’s certainly not the most likely scenario. 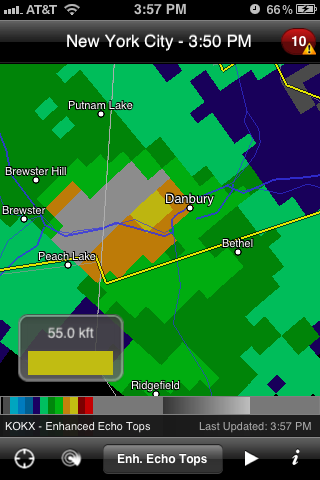 This image is of a particularly robust storm that has developed in western Connecticut near Danbury. Clouds have topped out in excess of 50,000 feet. The other story from any storm that develops is incredibly heavy rain. The air is rich with moisture and when it rains, it will pour. Doppler radar has indicated as much as 2 inches of rain in the last hour associated with the aforementioned storm in parts of eastern Putnam County, New York. Use the national weather service page or your favorite local media to track any storms that may affect your area over the next few hours. Things should dry out from west to east across the region during the 8-10 pm time frame. 26 year old blogger. Idealistic, hardworking, and optimistic. Bachelor's Degree and soon to have a masters degree.